We look forward to our annual shopping trip every year! Read our rules for shopping with a friend here. It was such a blast to stay with Krista’s parents! Her mom recommended we visit Bridgeport Plaza, which will now be a must-visit shopping destination whenever we come to Portland! For the last several years, we’ve taken a highly anticipated, annual overnight shopping trip together. 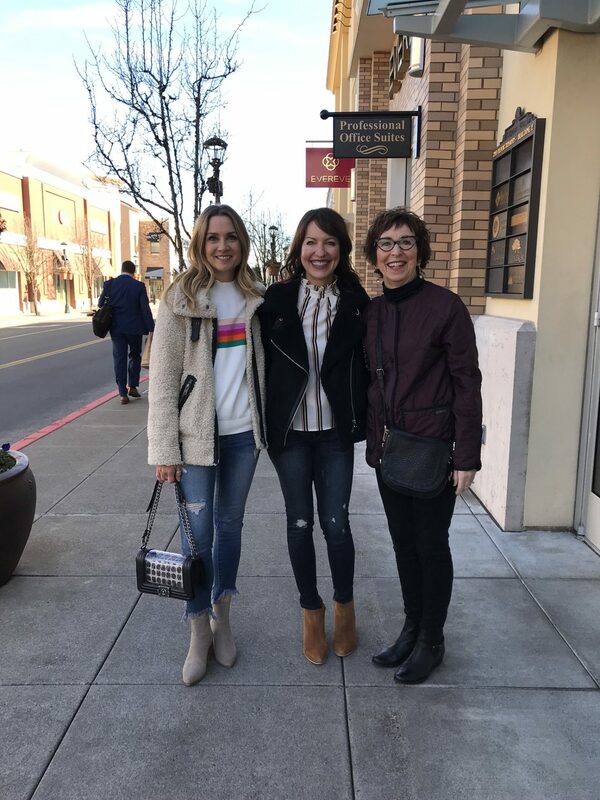 We used to shop after Christmas sales, but since starting Lastseenwearing, we decided to try spring shopping in Portland, Oregon for a tax-free, fun way to create content for our blog and Instagram. Our hopes were high, and we were ready to buy, but we were struggling a bit with some of the trends. Don’t get us wrong, we found some very cute clothes, but we weren’t as excited as we usually are while perusing the choices at our favorite stores. Even though we were a bit hesitant about some of the trends we kept seeing, we’ve learned to “never say never” in fashion. Here is our review of some of the major spring trends we encountered on our trip! Boiler Suits: This trend is basically a one-piece, mostly long-sleeved jumpsuit that resembles a mechanic’s uniform. Krista tried one on at Madewell in a pretty, pink color. She felt like it was flattering, but when she thought about wearing it in her real life, she just couldn’t picture it. The boiler suits we’ve seen that we like look a little less mechanic and more jumpsuit. While at the store, we noticed a sales lady was wearing a light-colored boiler suit that really made her look like she was just out fixing cars. I think it’s going to be a tricky piece of clothing for a lot of body types. After mucking around in the boilersuit trend, we had to try on something a little more um, basic. 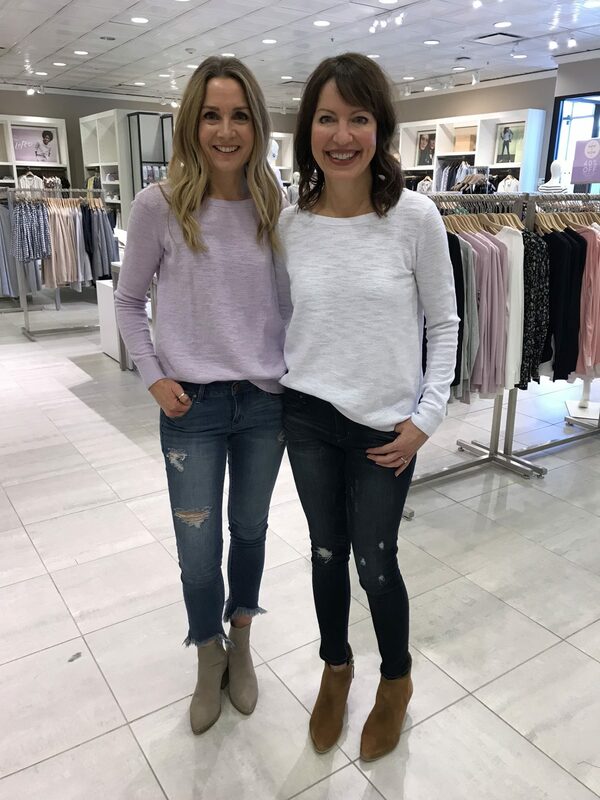 These simple spring sweaters were a total score on price and style! Tie-dye: This trend initially made us think of bad camp shirts, but on second glance, we can see potential. A big factor is the colors swirling around together–if they ‘re too primary or too neon we feel like we’re back in grade school chewing on Zebra Stripe gum. Krista tried on a silk two-piece dress from Zara, but we decided head-to-toe tie-dye is too much of a deep dive into this trend. Instead, Julie found a muted purple/cream/gray crop tee that is more subtle and looks cute styled with jeans or skirts. Tie-dye looks that pass the test! Julie loves the crop tee! Animal print: Animal print was popular in the fall and winter, and it’s still going strong into the spring! 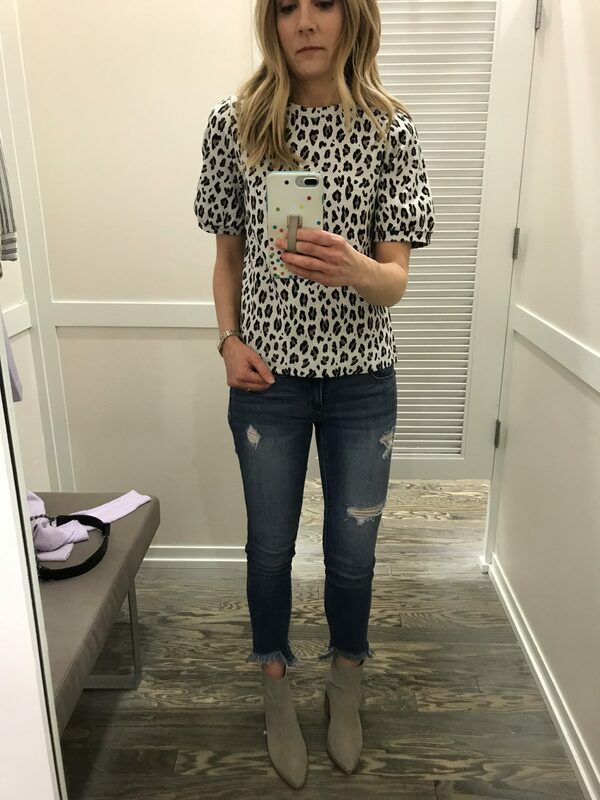 We love the leopard and snakeskin trend, but we’re not really digging the safari print we started to see from store to store. Perhaps after we see it more it will grow on us. Seeing jungle scenes and animals pictured on the clothing was a bit much, especially when the print is in a two-piece set! Animal print however, is a great neutral and it really does go with everything. If you’re hesitant at first, mix it in in small ways, like with a clutch, shoe or a t-shirt. Animal print in small doses is how we like to roll. The sleeves on this top are what caught our eye! Safari trend looks we love! Flared cropped pants: We loved all the varieties of flared, cropped pants! What a fun change from skinny jeans! Krista ended up loving a pair from Anthropologie. Of all the pairs she tried on, those were the most flattering and they weren’t too wide. The cropped flared pants that didn’t look great on her were way too wide or the print made them look too much like pajama bottoms. They’ll be cute with high or low sandals and so many tops this spring and summer. Krista’s pants plus two others we love! White: We loved all the white shoes and accessories we saw in the stores! White is so bright, crisp and modern looking whether it’s in shoes, pants, purses, jewelry, etc! Krista especially loves wearing white earrings because they stand out against her dark hair. Now we just have to keep it all clean! Jumpsuits & overalls: The jumpsuit trend came on the scene last year and is still going strong in the stores this year. If you didn’t hop on the jumpsuit train last year, don’t hesitate to get on board! There’s even more variety now and they’re such a cute option to summer shorts or dresses. 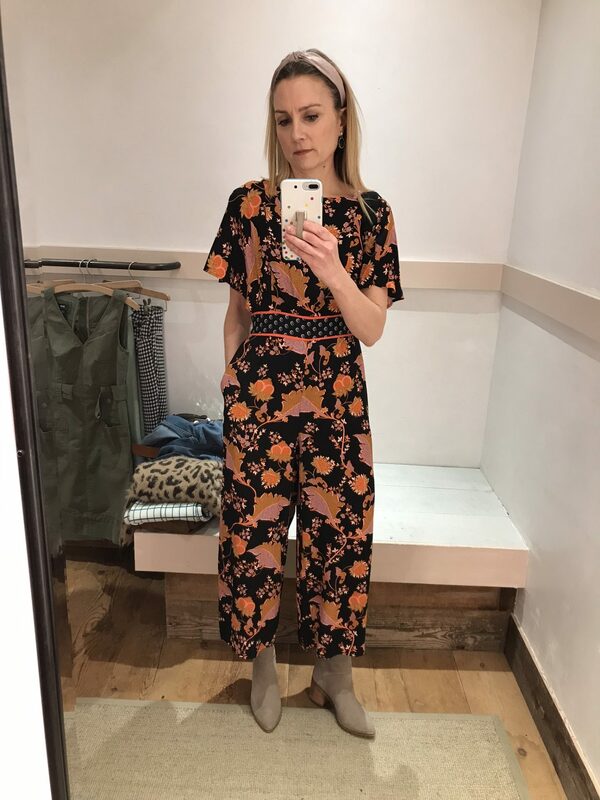 Our fave jumpsuit/overall styles tend to be cropped, short-sleeved or sleeveless, with a belt or other detail to give definition at the waist. Midi skirts: Skirts this spring seem to be either really short or midi-length long. The midi-length feels more appropriate for us, plus we love how it can be dressed up or down with just a simple change of top and shoes. To avoid potential frump factor, style skirts with a shorter top or front-tuck so the waist is defined. Wear with booties or sneakers in the cooler months of spring and switch to peep-toes and sandals come summer. Such a fun look! Julie has two of these midi skirts! Monochrome & matching pantsuits: When we told Krista’s mom that these two were trends for spring she said, “Oh great, I’d just gotten down the trend of having everything NOT matching!” What was old is new again, and it’s truer than ever for this trend. We LOVE monochrome looks–classy, elegant, bold–even in soft pastels. But the pantsuits? Not so much. The only way we’re fans is if the pattern is subtle and the pants are slim and cropped. If it veers too much into a baggy masculine cut, it isn’t flattering on anyone, not even a man! Krista has the pink set! While we didn’t love every spring trend, we’ve learned that given time, a trend often grows on us and next thing you know, we’re wearing it! 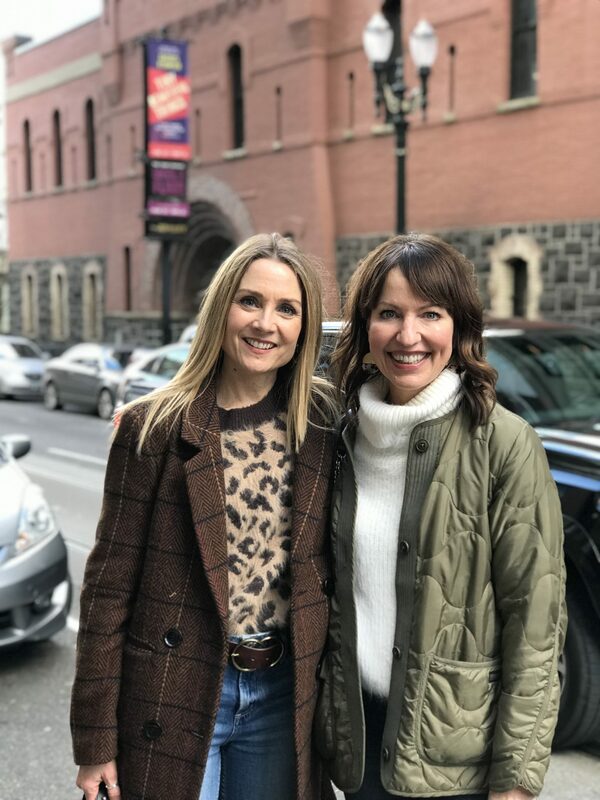 Don’t be surprised if you see us strolling the streets of Seattle someday in a safari boilersuit and a tie-dye matching pantsuit! Highlight to our Portland trip? 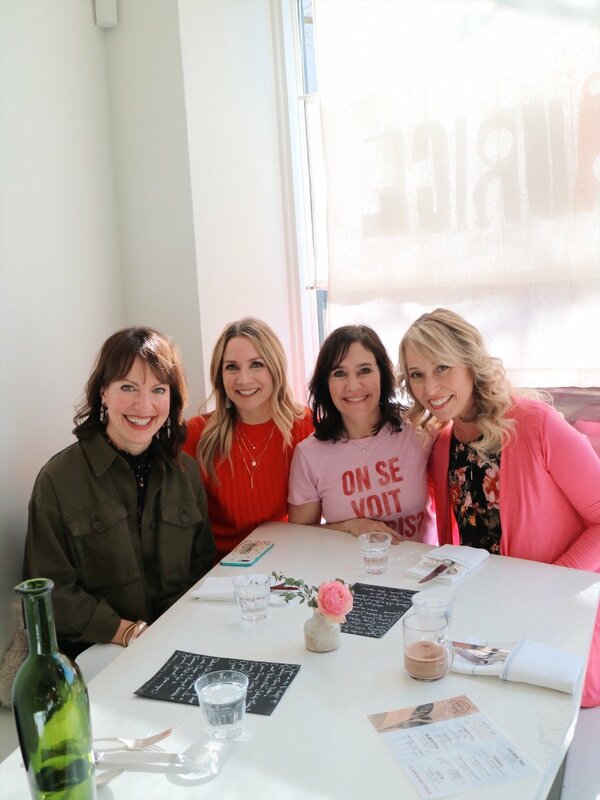 Meeting two fashion bloggers and Instagram friends in real life. Susie of @susie.wright and Jennifer of @style.smitten are even more beautiful and sweet in person! 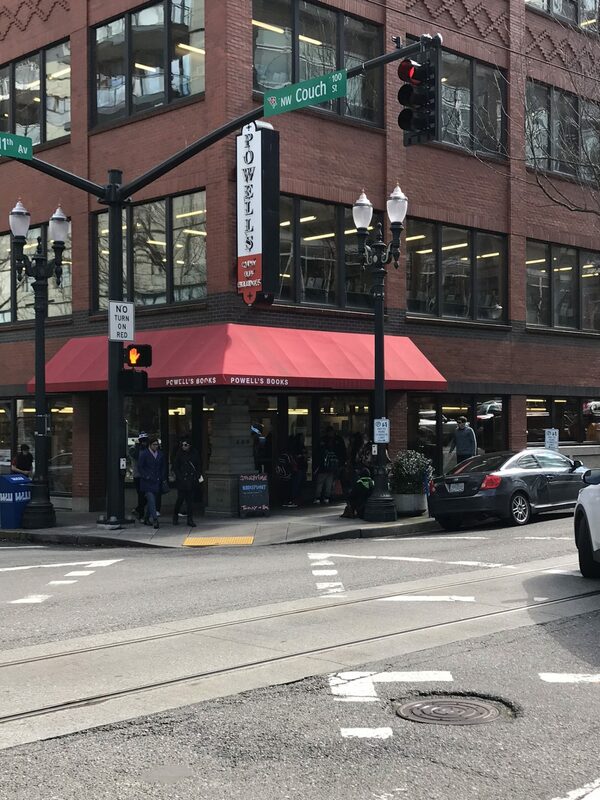 A trip to Portland isn’t complete with a visit to Powell’s bookstore! 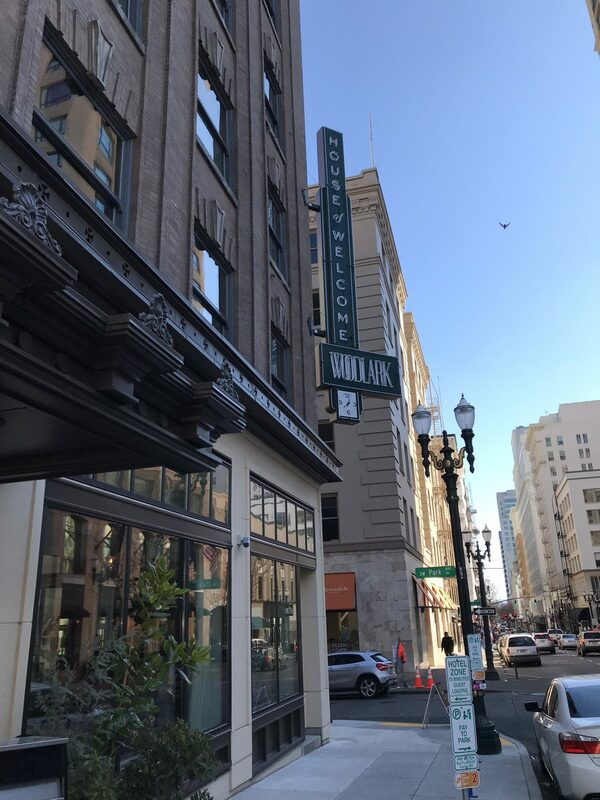 If we hadn’t stayed with Krista’s parents, we would’ve stayed at the Woodlark. Susie, who lives in Portland, says this is THE place to stay in the city!